Tuesday, February 1, 2011: During the STS-107 mission, the crew appears to fly toward the camera in a group photo aboard the Space Shuttle Columbia. 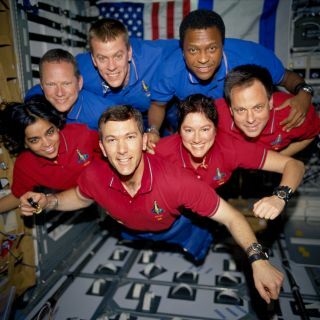 On the bottom row (L to R) are astronauts Kalpana Chawla, mission specialist; Rick D. Husband, mission commander; Laurel B. Clark, mission specialist; and Ilan Ramon, payload specialist. In the top row (L to R) are astronauts David M. Brown, mission specialist; William C. McCool, pilot; and Michael P. Anderson, payload commander. On February 1, 2003, during re-entry, the Space Shuttle Columbia disintegrated over northern Texas with all seven crewmembers aboard. This picture survived on a roll of unprocessed film recovered by searchers from the debris. CAPE CANAVERAL, Fla. — Three days into shuttle Columbia's 16-day venture in space the crew is reporting that all is well with their marathon science mission. "Things are going really great. We're having a great time up here," shuttle skipper Rick Husband said during a trio of media interviews held Saturday. NASA's first shuttle mission of the year began Thursday with a perfect launch from Kennedy Space Center. Immediately after reaching orbit the seven-member crew split into two shifts and settled into a routine of around-the-clock research operations. "We had a great ride to orbit and all the activation of the experiments and the SpaceHab went extremely well," Husband said. "We've got our space legs and we're up and running." Husband and fellow Red Team members Kalpana Chawla, Laurel Clark and Ilan Ramon have the day shift based on Houston time, while Willie McCool, David Brown and Mike Anderson are working the Blue Team overnight shift. With 79 experiments to conduct during the next two weeks, the work pace is intense. "We've been busier than I even imagined since things do take longer up here," said mission specialist Chawla. The crew includes Israel's first astronaut, Ramon, who said he found that the "launch was pretty exciting. A lot of noise and shaking." A self-described secular Jew, Ramon already has had a chance to see Israel from space and an opportunity to celebrate the Sabbath. However, neither event went well. Ramon said that the first time he flew over Israel the nation was mostly obscured by clouds and that he has just been too busy to even think about the Sabbath. The Israeli's presence on the mission prompted tight security measures for the launch at and around the space center, a fact Ramon said he was keenly aware of and thankful for the way it was handled. "NASA security and the county security were unbelievable and helpful. I didn't have any doubt that everything would go pretty good, and so it did," Ramon said. Clark, one of the mission's four space rookies, said an unexpected surprise about the space shuttle had to with the sounds you hear. "Obviously everything floats. The zippers and all the belts that have D-rings that we hold things down with are always floating and hitting each other and jingling," Clark said. "It makes this beautiful tinkling music in the background all the time. It just caught me off guard. It was beautiful." Later, mission scientists lauded the crew's efforts so far. Of particular interest Saturday was the start of a study that looks at the loss of calcium in the astronauts' bones. "It's our biggest day," said NASA scientist Scott Smith. "We had everybody kicking in one way or another to help with the experiment." Astronauts participating in the study swallowed pills and injected fluids with tracer chemicals that will show up in samples of urine and blood taken later in the mission, indicating the loss of calcium. "It's one of the great things we can do to easily understand bones during spaceflight," Smith said. "The loss of bone is a significant health concern for astronauts." "What we're doing on this flight will help us to understand the early changes during spaceflight, what happens in the first days to weeks of weightlessness and how the body adapts to that," Smith said. Columbia's mission is scheduled to end Feb. 1 with a landing back in Florida.